Beachfront condo with spectacular views •A hot tub that sits next to two crystal clear swimming pools. Fully furnished condo with all the amenities of home including: A fully equipped kitchen, dishwasher, refrigerator, and washer dryer. 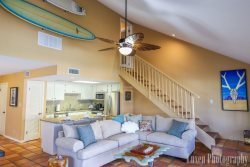 This open and airy 2 bedroom 2 bathroom condo lets you know you are on a beach vacation from the minute you open the door to the classic theme. The Master , Living with TV DVD. The views from the big balcony will make you want to stay forever. Beach Accessory Closet Chairs etc. IMPORTANT It is important to note that this is a self catered home no room service or maid service.. please bring all supplies and items you want to make sure and have during your vacation. Kitchen is fully equipped we also provide soaps& bath soap, extra paper towel and tissues, paper plates, paper napkins solo cups etc. Make sure to bring electronic devices, music, and gaming, computers and video to TV cables are great and dvd movies. make a left on Padre Blvd. Drive Approximately 3.5 miles and then turn right on East Bahama, Turn left on Gulf Blvd and watch on your immediate right for the BEACH HOUSE Gates. You will arrive and check in at the Office, just follow the posted signs after entering the gate. You will also be provided with a parking permit and resort information.